i3Detroit is Metro Detroit’s largest community-run DIY workshop. A collision of art, technology, learning, and collaboration. Whatever you want to build, you can do it here. Ever dream of a place where you could build and craft your heart’s desires? A place to find other Do-It-Yourself-ers and get tips and advice? A place where you could learn to use and have access to tools that would never fit into your garage or your budget? That place exists, today. Welcome to i3Detroit. Here at i3Detroit, we want to create and build, probably much like yourself. We’re not a profit-driven tool rental center, we’ve got a burning passion to create, tinker, hack and make, one that drives us to create the best possible community and space. Our members take pride in what we’ve built, and for good reason. We’ve got such a diverse range of things to create with here, and we’ve done it all as a highly-engaged volunteer community with a passion for things such as crafting, woodworking, metalworking, electronics, welding, programming, and digital fabrication! Located near the heart of Ferndale, we’re close to many local events and an amazing community. If you’re curious about, or never heard of a Makerspace, then swing on by on a Friday evening (6:00 to 9:00 PM) to take a tour and get to know the membership! Excited? Gotten this far? Come see us! You’ll find this is just the place you’ve been looking for! Sell your soul and connect with us on social media! i3 Detroit prides itself on being an open community, but that doesn’t mean anyone can just walk in, hand over $49, and get a key. We like all of our members to come check the space out and meet a few of the members before becoming a part of the community. Our signup process requires prospective members to get familiar with a community-run organization before joining. We are a lot of people who know a lot of things. We do our best to put all of that knowledge into one place, the wiki. You should be able to find information including what tools we have, what is a laser cutter, who is responsible for cleaning the toilets and what famous character we made out of duct tape. Take a gander. i3 Detroit is always actively seeking Donations and Sponsorship to help continue our growth and educational goals. If you are interested in helping our community we have many options for you to help. Since i3 Detroit is a 501c3 organization your contribution may be tax deductible. Check out what we will be up to! You can find all of our happenings here. The calendar includes all of our reoccurring events and classes. https://www.i3detroit.org/wp-content/uploads/2014/03/Logo_large_png8-300x98.png 0 0 surferdudemi https://www.i3detroit.org/wp-content/uploads/2014/03/Logo_large_png8-300x98.png surferdudemi2019-04-17 13:21:312019-04-17 13:21:48Got Scrap? 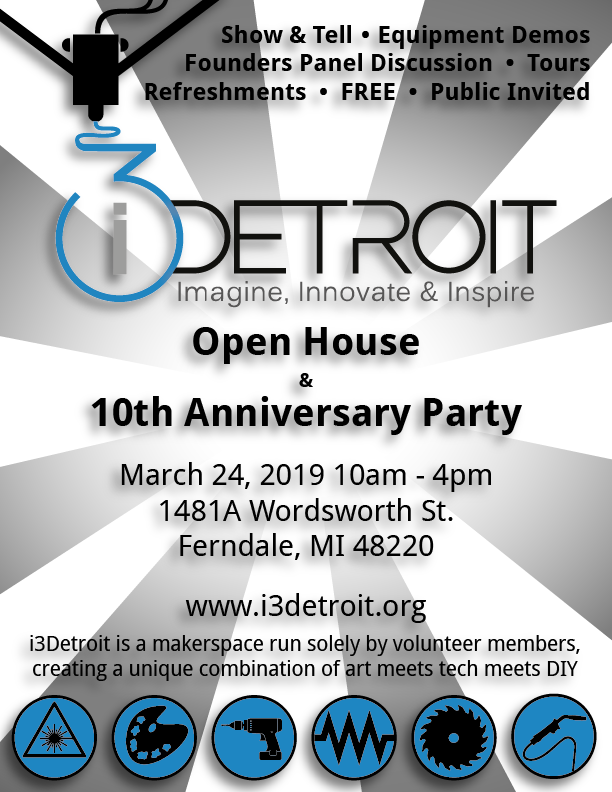 i3Detroit is 10 years old this year! On Sunday, March 24, 2019, we will be hosting an Open House from 10:00 AM to 4:00 PM to celebrate. The event is free to the public and will feature tours and demonstrations of woodworking, machining, 3D printing, sewing, electronics, injection molding, leatherwork, ceramics and glasswork, laser cutting and robotics. i3Detroit is a volunteer community — no staff, no regular business hours! If you would like to learn more about the community and capabilities of i3 stop by on a Friday night after normal business hours. If you want to see how we herd 150 cats stop by on the first or third Tuesdays of the month. The cat-herding starts at 7:30. Want to ask a question or propose something to the entire membership? Use our public google group.